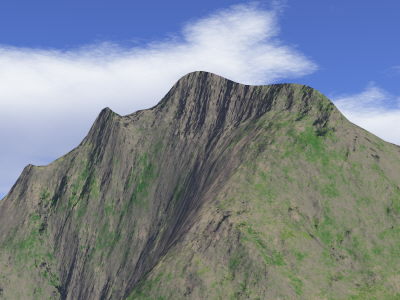 Both of these images were rendered from terrain resized from the same 129x129 terrain using Spline method on Picture Publisher 10. 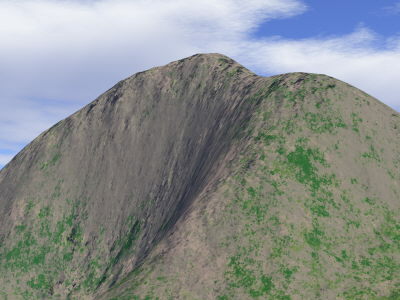 This image was rendered from terrain enlarged directly from 129x129 to 513x513. The smaller peaks of the mountain have been smoothened away. For this image, the terrain was first expanded to 516x516 (exactly 4x the original) and then the additional 3 pixels were croped to get 513x513 terrain. The original altitude variations are preserved better, but some smoothening has still occured.